Neil Armstong, the first man to step on to the Moon, has passed away at the age of 82. Born August 5, 1930, Neil Armstrong was a Navy pilot that began his long journey into the history books when he joined the U.S. Air Force's Man In Space Soonest in 1958. After working on several projects related to the space race, he was asked to become a member of the second group of astronauts, known as "The New Nine" on September 13, 1962. He went into space twice during the Gemini program, both on Gemini 8 and Gemini 11. Armstrong served as the backup commander for Apollo 8, and on December 23, 1968 was offered the primary command position of Apollo 11, the first flight scheduled to actually turn down on the surface of the Earth's lone satellite. Once Apollo 11 reached the moon on July 20, 1969, there was a scheduled rest period for himself and Buzz Aldrin, but Armstrong requested the EVA (extra-vehicular activity) be moved up. Once the go ahead was given, and Armstrong and Aldrin were suited up, Armstong had been chosen to be the first down the ladder as NASA felt he did not have a big ego and could handle the historic moment. Armstrong's left boot touched the surface of the Moon at 2:56 UTC July 21, 1969. Armstrong later revealed that he had actually meant to say, "That's one small step for [a] man, one giant leap for mankind." 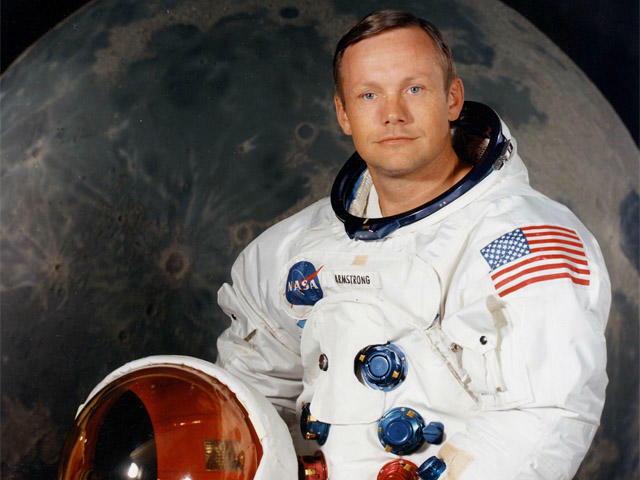 In his life after the historic Moon landing, Armstrong spent his life as professor of engineering at the University of Cincinnati and was notoriously private in his personal life. He left NASA one year after the Apollo 11 mission, but aided in the investigations into the Apollo 13 mission and the Space Shuttle Challenger disaster in 1986. Armstong underwent surgery on Aug. 7 for blocked coronary arteries before passing away this morning. His family released the following statement announcing his passing.